Summary: It’s amazing but true: there are approximately six hundred million pet cats around the world! And why not? Not only are they playful, cuddly, and smart, they are also very helpful. Best known as skilled hunters, they can also predict storms and earthquakes, bring comfort to the sick, and have been known to detect diseases in humans. The love of cats goes back to the ancient Egyptians who worshipped them. Young readers will be fascinated to find out all the rituals attached to cat worship—and will be surprised to discover how cats played a role in the defeat of the Egyptians by the Persians. In her lively narrative style, author Elizabeth MacLeod recounts the origin of the superstition about black cats—and how owning any cat could have saved your life during the Plague. She explores the role of cats in Japanese and Chinese culture, and provides a useful guide to how cats communicate, both with other cats and with humans. This is the perfect book for a cat lover. Adult, teen or child if you want to know more about the history of cats, this book will tell you what you want to know. The book talks about a long time ago (Ancient Egypt) and recent (Grumpy Cat). It covers good luck cats, bad luck cats, cat Gods, Working Cats and more. At the back of the book is a list of places to visit related to these cats, main sources of information on them and books for further reading on each. You’ll even learn what cat a Meowth from Pokémon is based off of. Each page has photographs, drawings and such to go along with the stories and explanations. The book is listed as for ages 8-11 which is definitely what it’s aimed at but tweens and teens could definitely enjoy it too. 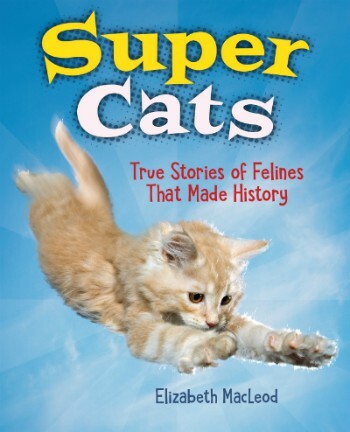 Check out this quiz at the Annick Press blog: Are you a Top Dog or Super Cat? Also check out Top Dogs.